MoonMarble.com - Cathy Richardson - "School of Angelfish"
Art Glass → Contemporary Handmade Marbles → Cathy Richardson - "School of Angelfish"
Handmade marble by Cathy Richardson. 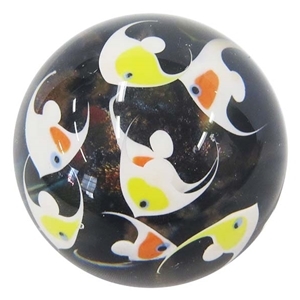 This marble has a black speckled ocean floor background with yellow & white fish and orange & white fish swimming in two layers inside the marble. Approx. size is 2 1/4" in diameter. Signed "Richardson" and dated.